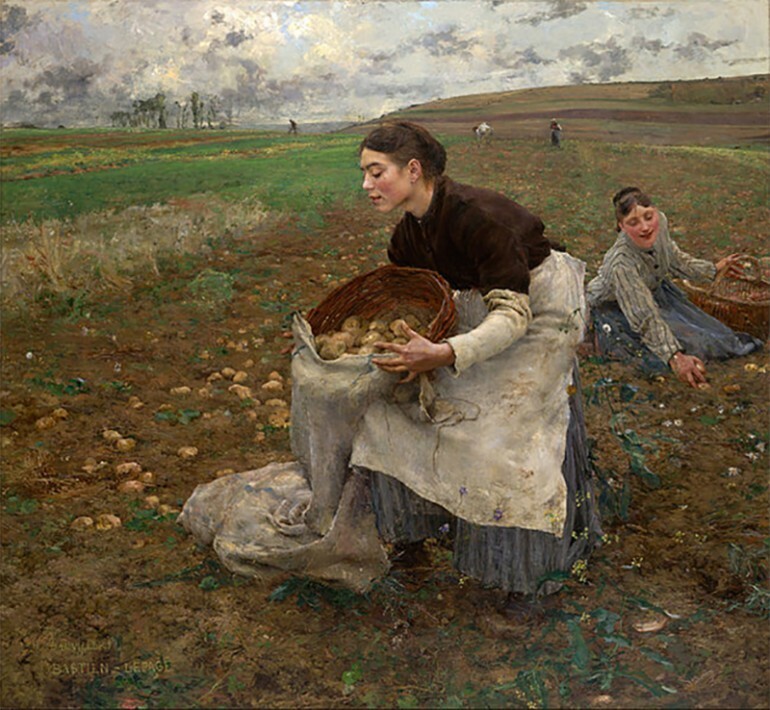 Called by Emile Zola as the “grandson of Millet and Courbet,” Jules Bastien-Lepage was born on November 1, 1848 in Damvillers, Meuse, a rural village in France. He spent his childhood there with his family, who nurtured and supported his interest in drawing at an early age. Jules Bastien-Lepage became known for his ability to capture the sentimentality and simplicity of rural life in France. Although he grew up during the time when Impressionism was the prevalent art movement, his style was more reminiscent of the beautiful and evocative works of French realist artists Jean-François Millet and Julien Dupré. What was interesting was that many Impressionist artists in Australia, America, Holland and Scotland preferred his style of plein air painting that was natural and realistic in approach than what the true Impressionists were doing. Emile Zola even said that his style was an Impressionist style that was adapted and corrected to correspond to the preferences of the masses. The area where Bastien-Lepage grew up was a farming village. He has a passion for sketching at a young age and his family supported him by buying prints of painting so that he could copy them. He received very basic art training from his father and started formal lessons in art at Verdun then Paris. In 1867, when he was 19 years of age, he gained entry into the Ecole des Beaux-arts, where he became a student of Alexander Cabanel. During his three years of study, he was a first prize winner for drawing but gained very little attention when he exhibited in the Paris Salons in 1870 and 1872. He gained critical attention for his paintings, “Song of Spring,” a study of rural life, and “Portrait of my Grandfather” in 1874. These paintings were especially noted for the true-to-life elements he gave them. He continued to impress art critics but failed to win the top honors in the Prix de Rome in 1875 and 1876. However, he had successes in other paintings such as the “First Communion,” the “Portrait of M. Hayern” and “Angels Appearing to the Shepherds,” all done in 1875 and “Priam at the Feet of Achilles” in 1876 and “Haymaking” that was painted in 1877. Jules Bastien-Lepage’s career was short, for it only lasted from 1874 to 1884, a span of 10 years. During those years, he focused on only two subjects – rural scenes showing the daily lives of ordinary people, mostly from his childhood village, and portraiture, with several pieces showing theatrical performers, including Sarah Bernhardt. His painting style showed some elements borrowed from his contemporaries and predecessors. He borrowed compositional techniques from realist painters Jean-François Millet and Gustave Courbet, while he added the vibrant touch and light tones employed by most Impressionist painters. Bastien-Lepage’s en plein air genre painting brought him greater fame. He was recognized in his native country as a rural naturalism’s critical exponent – where, what was called his own style – a corrected Impressionism or corrected Realism – provided the inspiration for the members of the Heidelberg School of Australian Impressionism that was based in Melbourne, such as Fred McCubbin, Arthur Streeton and Tom Roberts. It also inspired American painter Theodore Robinson, Glasgow School of Painting artists including James Guthrie and members of The Hague School in the Netherlands. He continued to gain the attention of many art critics not only in France but other parts of Europe and his fame allowed him to travel to Italy, Switzerland and England, which provided him with many subjects for his genre, portrait and landscape works. 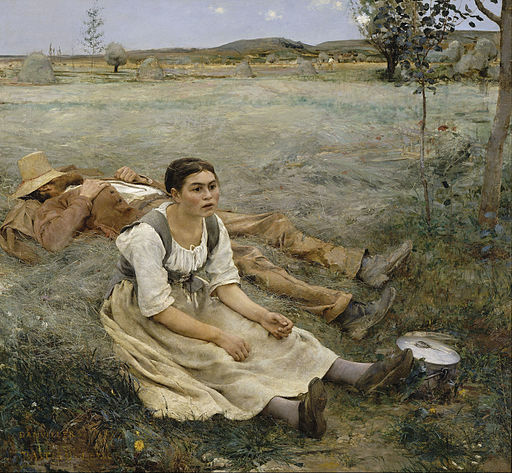 Jules Bastien-Lepage, who was critically injured during the war, tried to recover his health in Algiers but in 1884, died of stomach cancer when he came back to Paris. The following year, Ecole des Beaux-Arts in Paris staged a commemorative exhibition of more than 200 of Bastien-Lepage’s drawings and paintings.